You can lend a hand to restore salmon habitat for future generations! 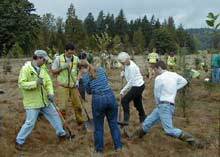 Volunteer at a stewardship project to restore land and water in southern King County. Get involved in planting native plants, tearing out weeds, watering and other activities at a habitat restoration site. Act on the fact that Puget Sound Starts Here! in your backyard, on your street, in your community.